Written by Gerry Fanaken, this new publication covers a very wide gamut of strata corporation administrative issues and topics. What are the common mistakes to avoid in order to minimize problems. Additionally, Gerry Fanaken offers unique insights about the history of strata corporation administration over the past four decades including changes to the evolving legislation, management company practices, government regulatory requirements, real estate agent interaction and much more. 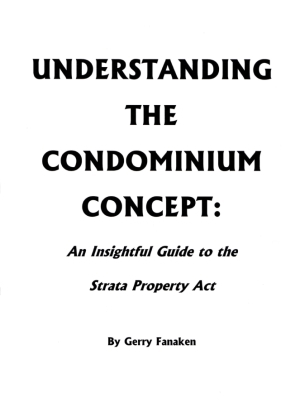 Gerry Fanaken has over the years written hundreds of articles on strata administration and several guidebooks. Shortly after the Strata Property Act became law in July 2000, he wrote The New Condominium Concept (Revised): An Examination of the Strata Property Act. Since that time, there have been amendments to the legislation, many court decisions and new interpretations of the legislative requirements. His new book delves into all aspects. It is written for use by strata councils, property managers, students in property management courses, condo owners, and the general public. Although it is not a legal textbook, lawyers and notaries will find useful comments and practical advice that may assist them in fulfilling their professional obligations when the need arises. Gerry Fanaken has been a condominium owner since 1974, in a Vancouver westend highrise of 115 strata lots. He has been a council member and President for many years during this period. Mr. Fanaken was, from 1980 to March 31, 2011 the Chief Executive Officer of Vancouver Condominium Services Ltd. (“VCS”), one of the largest and most prestigious strata management firms in B.C., managing about 165 strata corporations. He was one of the founding members of what today is known as the Condominium Home Owners’ Association of British Columbia. He has taught a number of courses at various community colleges and has given lectures, speeches and other public addresses for many years. He was a founding member and director of the Vancouver Chapter of The Canadian Condominium Institute, and also a founding member and director of the Strata Property Agents Association of B.C. In addition to dozens of educational bulletins which were published monthly and available on the VCS website, Mr. Fanaken wrote numerous guidebooks on strata corporation administration. The Provincial Government and some of its crown corporations and ministry departments have, from time to time, called upon Mr. Fanaken for advice and direction with respect to strata corporation matters. These have included the Ministry of Finance and The Financial Institutions Commission. Mr. Fanaken assisted the Real Estate Council of British Columbia with the development of regulations, policies and practices in respect of the licensing of Strata Property Agents which became effective January 1, 2006. During the leaky condo crisis in 2000, Mr. Fanaken was a member of a CMHC sub-committee on developing a protocol manual for moisture-troubled buildings in British Columbia and also a member of other sub-committees by professional organizations dealing with the leaky condo crisis. He was a member of the first Provincial Advisory Council of the Homeowner Protection Office (HPO) of British Columbia. Mr. Fanaken has been a guest speaker at various functions organized by groups dealing with condominium issues including The Continuing Legal Education Society of B.C. and The Insurance Institute of B.C. Mr. Fanaken has been appointed ten times by the British Columbia Supreme Court to act as an Administrator for strata corporations in trouble. Mr. Fanaken was the Administrator in several dysfunctional strata corporations which gave rise to key court decisions in respect of administrators, i.e. Cook, Aviawest, and Clarke. Mr. Fanaken is a graduate of the Ryerson Polytechnical Institute (Toronto) in Business Administration (1966).